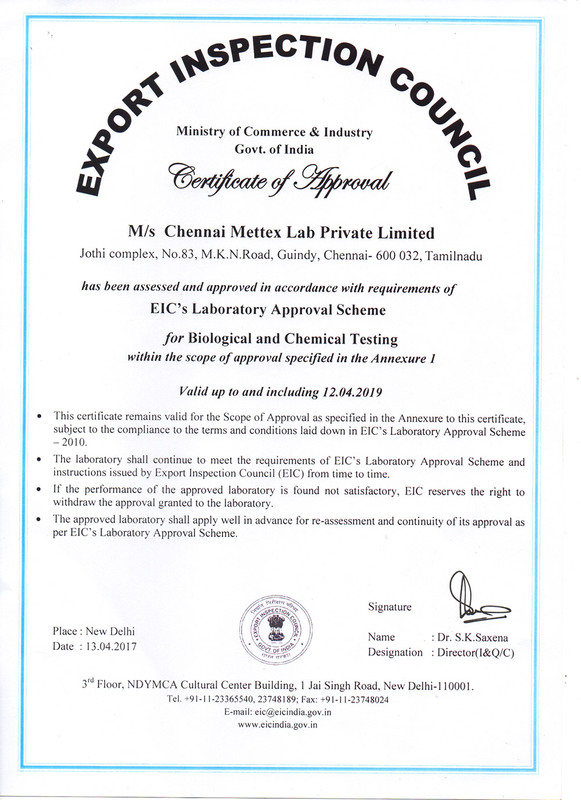 fssai approved labs in chennai,food testing labs,nabl accredited labs, food testing labs in chennai,food analysis lab, nabl accredited labs,soil testing labs in chennai. 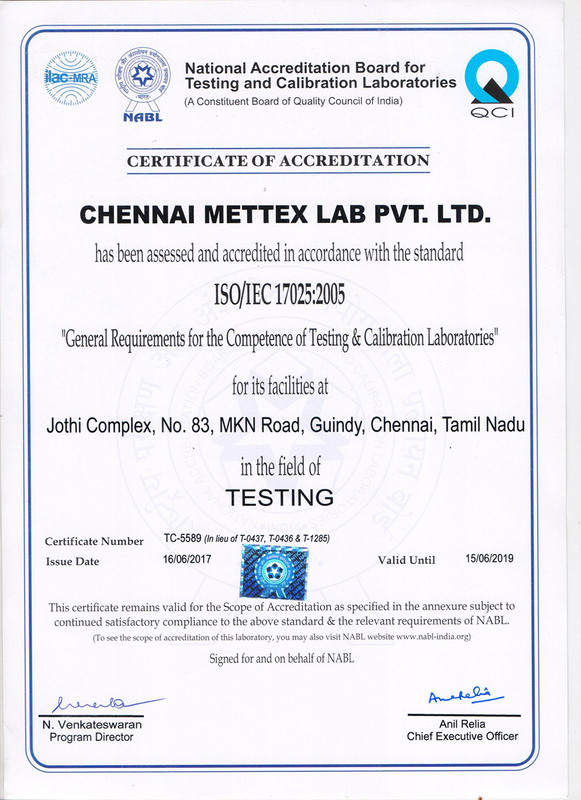 Chennai Mettex Lab, a NABL accredited Laboratory, started its operation in 1984, is one of the leading test houses in South India.Chennai Mettex Lab, a trusted testing laboratory for the last 2 decades, offer services for TESTING OF FOOD AND AGRICULTURAL PRODUCTS Ready to eat foods, Raw, Processed Semi – processed , Canned , Thermally processed, Ready to eat extruded snacks , Dairy & Dairy Products. 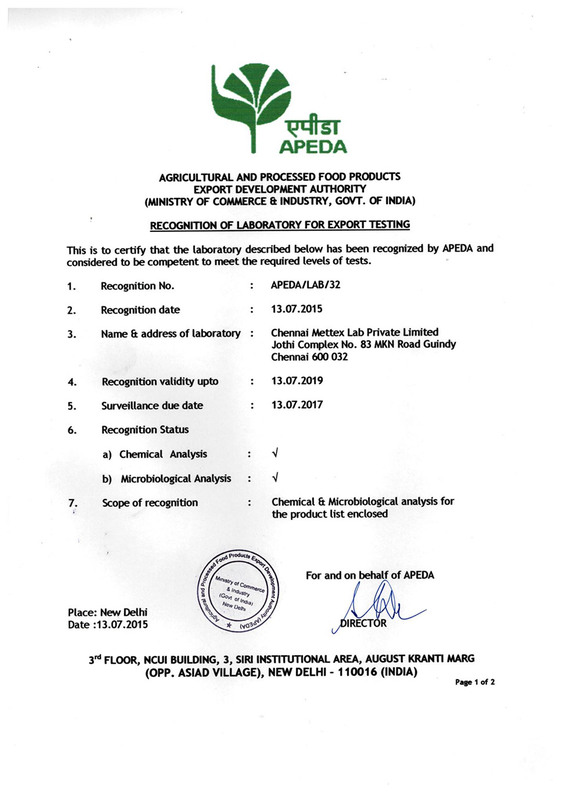 (Raw & Processed),Milk powder,Ice cream, Condensed milk partly skimmed & skimmed condensed milk, Cream, Skimmed milk powder, Butter oil, Dairy whitener, Partly Skimmed milk powder, Packaged pasteurised milk, Butter, Khoa, Bakery & Confectionery Products, Chocolates, Alcoholic & Nonalcoholic beverages, Carbonated beverages, Paneer, Follow-up-formula-complementary foods, Infant milk substitutes, Fruits, Vegetables and its products ,Raw & Processed, Processed fruits, vegetables, Jam, jellies, marmalades, Sugar, Vinegar, Flavours used in Preservation & food Industry, Animal Feeds & Feeding Stuffs, Cereal and Cereals Products, Milk Cereal Based Complementary Foods, Edible Maize Starch Corn Flour,Processed Cereal Based Complementary Foods, Guar Gum, Wheat Flour,Infants Foods, Meat and Meat Products, Fish & Fishery Products & Others (Raw, Cooked, Frozen, Dried, Salted, Canned & Ready To Eat Food),Frozen Prawns, Shrimps, Frozen Minced Fish Meat, Spices and condiments ,Whole Ground & Oleoresin, Tamarind concentrate, Coriander Whole and Ground nuts, Coconut and Coconut Products, Nuts and Nut Products, Egg and Egg Products, Egg Powder, Drinking Water, Potable Water, Raw water, Well Water, Borewell Water, RO Water, DM Water, Water for Processed Food Industry, Packaged Drinking Water, Packaged Natural Mineral Water, Packaged Natural Mineral Water, Fish Processing Industry-Water and Ice, etc ….. Waste Water, Treated Water , Recreational Water, Microbiological monitoring of Environment. Carbon Steel, Alloy Steels, Cast – Iron, Alloy ,Cast – Iron, S.G Iron, Stainless Steel, Tool Steel, Nickel , Nickel Base Alloys, Aluminum, Aluminum Base Alloys, Copper , Copper Base Alloys, Carbon Steel ,Alloy Steels, Sintered Iron, Stainless steel, Ferrous Metal – Cast Iron, Alloy Cast Iron, Pig Iron S.G. Iron, Aluminium Anode, Zinc , Zinc Base Alloys, Gold, Gold Alloys, Nickel, Lead Alloys, Silver, Silver Alloys, Ferrous metal – Carbon Steel, Low-Alloy Steel, Ingot Iron, Wrought Iron, Cast Iron, Tool Steel, Medium & High Alloy Steel, Non Ferrous Metal-Copper, Aluminium / Zinc and Its Alloys, Chemical Analysis, Mechanical Tests, Food, Water, Environmental, Gold, Metal ferrous and nonferrous metals, Aluminum, Copper, Nickel, Lead & Zinc base alloys, Bitumen and its products, Precious metals like Gold, Silver, Platinum, etc. Electro-Technical Products - Plastic, Leather, Polymer, Paper, Rubber, Metals and their Related Products etc.. Branches : Tamil Nadu , Chennai / Erode/ Namakkal District / Madurai / Coimbatore/ Puducherry/ Pondicherry/Maharashtra/ Mumbai/ Navi Mumbai/ Karnataka / Bangalore / Bengaluru etc..